The Cycle Philly commuting map, as seen this morning. The aggregated data provides an additional resource for local planners and agencies. This insight into bicycle trends, routes, and trip purposes will allow for the implementation of better bicycle facilities like bike lanes and trails. 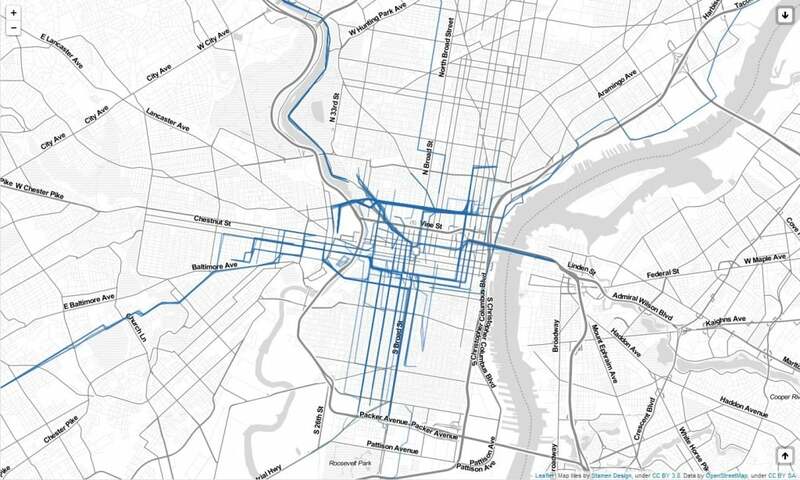 This is the first bike route mapping mobile application for the Philadelphia area. While national bike mapping applications, such as MapMyRide, focus on the user’s bike time or fitness goals, CyclePhilly’s resulting data will be beneficial for all. Corey Acri, a volunteer for Code for Philly, noted that he was originally interested in “developing a smartphone-based project to collect voluntary data on cyclists’ bike route preferences that could help the city build better bike routes.” Similar applications were successfully implemented in places such as Atlanta, Austin, and San Francisco and Acri had no problem building interest in Philadelphia, which according to a Bicycle Coalition report, has the highest rate of bicycle commuters per capita in the nation. Despite such enormous interest for the project, Acri said none of it could have become a reality without the work of Code for Philly’s programmers. Technically Philly covered the app’s launch last week, and it’s currently the #1 most-downloaded app in the Bicycle Coalition offices (the holy grail of app developers). I imagine it’s gonna be just as network-thirsty as Waze or most other gps apps. A lot of cyclists frugally share a family plan. Still grateful for the benefits and excited to try it, nonetheless. I would prefer to just tell you guys where I go since I forget to activate MapMyRide all the time! I bike from south Philly, near Oregon, up seventh, to Washington, then eleventh, then walnut, to get to school at the UArts. I discovered that ninth is not bike friendly at all. I was honked at and nearly side swiped by two cars. Thanks, but this isn’t the kind of data collection where we can add routes manually. It’s also not about “where you bike regularly” but specifically when and why. I encourage you to give the app a try – it’s pretty lightweight and works fast (at least on my clunky iPhone 4). Go to cyclephilly.org and click on “Map.” That’ll show you the live map.